From ceiling to the floor, gray is pitched like an architectural symphony with a maroon accent. A modern gray kitchen with a maroon accent wall feels a bit urban for a house at the Massachusetts shore. But that’s precisely what makes this kitchen interesting. A sense of place doesn’t always trump the style the home owner desires. 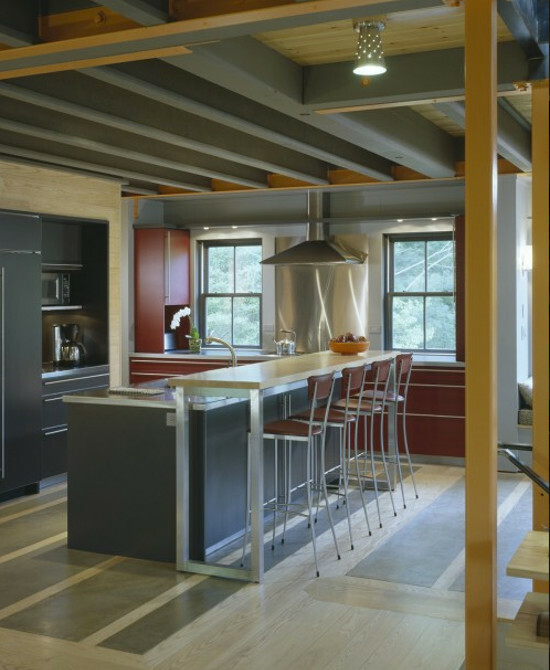 Here it is strictly architectural, Bulthaup style, with many refinements that reinforce a kitchen with a very unusual color scheme from the 1950s — dark gray and maroon. Dark gray modern metal cabinets have clean lines and swank details like stainless steel counters and a built in paneled refrigerator. A gray similar to the cabinet color also is used on the exposed ceiling beams, which helps keep them modern looking. Most interesting are gray stone panels that create a broad striped pattern inset into the the pale ash flooring. The maroon accent in the kitchen takes place on the range wall by changing the cabinet color. The cabinet color change creates an accent wall even though wall space is minimal due to the pair of gray casement windows and the stainless steel range guard between them. The stainless chimney hood is installed over a cook top with the chimney pipe running through a shallow horizontal shelf installed to house task lighting. As in many galley kitchens, the main sink is located on the island. That backs up to a bar-height eating table for four that looks like it was pushed up against the island. But the island still has storage on that side with doors that can be opened when the stools are pulled away. I’m not generally a fan of eating bar arrangements but this one is clever and flexible. Since the eating bar also faces into the adjacent room it could well do double duty as a buffet or bar for entertaining.